"Sometimes I feel like you're the only one who gets me." 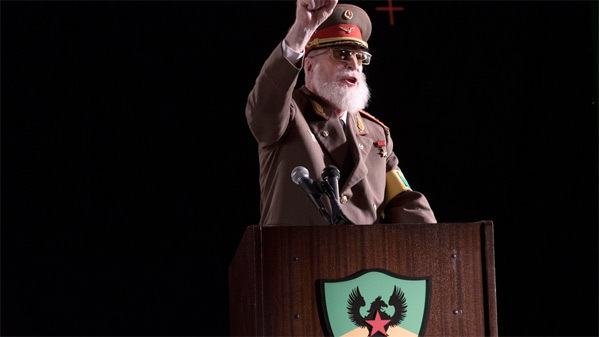 Cinedigm has released the trailer for an amusing indie comedy titled Dear Dictator, which has a goofy, perhaps ridiculous premise. Michael Caine plays a British-Caribbean dictator who is forced to leave his island nation. He decides to move in and hide out with his "pen pal" (is this the 90s? ), a young rebellious teenage girl, as played by Odeya Rush (from The Giver, Goosebumps, Almost Friends, Lady Bird). Somehow they make this work in a weird way, and of course he helps teach her how to "start a revolution and overthrow the 'mean girls' in her high school." It's not as bad as it sounds, but it also doesn't look that good either. But, Michael Caine! He's always great, right? The cast includes Jason Biggs, Katie Holmes, Seth Green, and Jordyn Cavros. Check it out if you're intrigued. When political turmoil forces a British-Caribbean dictator, General Anton Vincent (Michael Caine), to flee his island nation, he seeks refuge with his pen pal, a rebellious teenage girl (Odeya Rush) in suburban America, and teaches her how to start a revolution and overthrow the "mean girls" in her high school. Dear Dictator is both written and directed by filmmakers/writers Lisa Addario and Joe Syracuse, both writer/directors of the films Lover Girl and Amateur Night previously; and the writers of the script for the upcoming The War with Grandpa. This hasn't premiered at any film festivals or elsewhere. Cinedigm will release Dear Dictator in select theaters + on VOD starting March 16th soon. Anyone want to see this film?